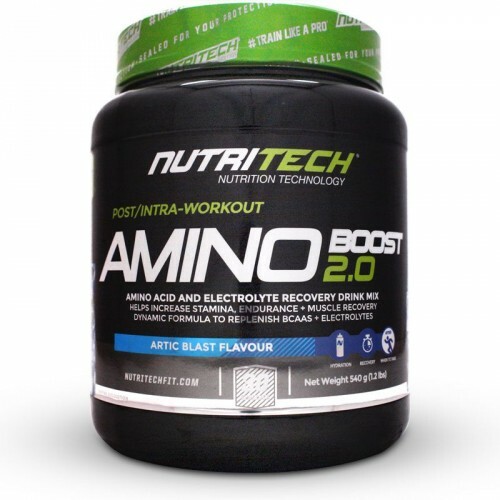 Nutritech Amino Boost 2.0 is an amino acid and electrolyte drink for better workout recovery and muscle grow. Intense training may cause a catabolic effect where your body uses muscle fibre as fuel. Fitness athletes and lifters avoid workout catabolism as much as they can. Taken before at gym session the amino acids in this product prevent muscle breakdown during exercise. The amino mix contains L-Leucine which plays a role in protein synthesis. It enables your body to process the protein you eat and drink more efficiently by means of the mTOR pathway. This then stimulates lean muscle gains. As a post-workout drink the Branched Chain Amino Acids (BCAAs) in the amino mix have been shown to improve recovery in athletes. BCAAs may also boost training performance by reducing fatigue and increasing stamina. Perfect for lifters looking for a caffeine-free performance booster. High concentrations of BCAAs are found in foods such as Salmon, Milk and Cashew Nuts. Due to the benefits of Leucine Nutritech have formulated a unique ratio of 8:1:2 of the three BCAAs giving you the full potential of Leucine. The BCCAs are instantized which means they dissolve easily and are rapidly absorbed. 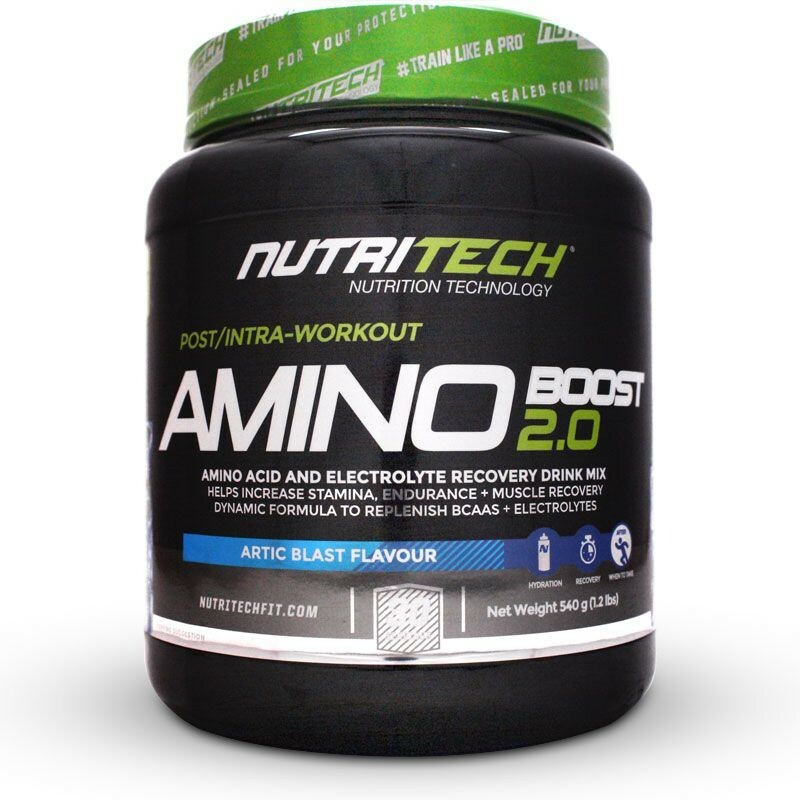 Nutritech Amino Boost 2.0 is a comprehensive amino drink to help grow and protect lean muscle in hard-training athletes. Amino Acid & Mineral Complex (L-Leucine, L-Glutamine, Taurine, L-Arginine, L-Citrulline, L-Valine, L-Isoleucine, L-Tyrosine, L-Histidine, L-Lysine, L-Phenylalanine, L-Methionine, L-Threonine, Potassium Chloride, Magnesium Oxide, Calcium Ascorbate, Sodium Chloride, Di Potassium Phosphate), Maltodextrin, Waxy Maize Starch, Citric Acid, Malic Acid, Flavouring, Non-nutritive sweeteners: Sodium Cyclamate (E952), Sodium Saccharin (E954), and Acesulfame Potassium (E950), Colourant (E133). • Mix 1 scoop with 250 – 300 ml of cold water. • Take 1-3 servings per day. • Drink 1 serving immediately after your workout. • Can be taken before or during your trainin to increase stamina. Regular training and proper nutrition are essential for achieving your goals. This product is not intended to diagnose, treat, cure, or prevent any disease. Consult your doctor prior to using this product especially if you have any suspected or known medical condition. Do not exceed recommended daily intake. Dietary supplements should not replace a proper diet.